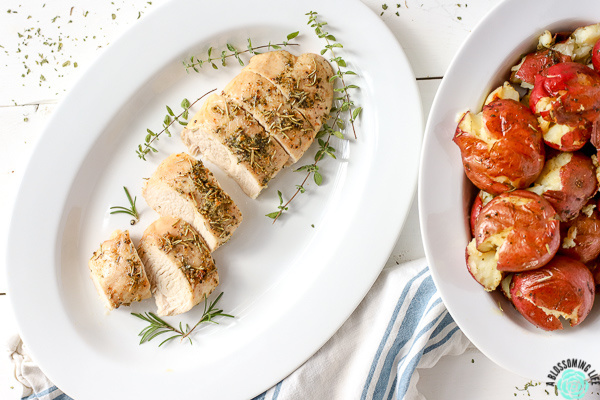 This simple recipe for Roasted Turkey Breast is bursting with flavor from herb-infused butter and is cooked to perfection, creating a juicy and tender turkey breast. This easy turkey dinner recipe can be made any night of the week or for a small Thanksgiving get-together. Follow the tips below to roast the perfect turkey breast and get turkey dinner inspiration. 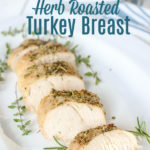 For this recipe you will need: boneless turkey breast, butter, dried rosemary, dried parsley, garlic salt, and pepper. This roasted turkey breast recipe was kind of a fluke. I randomly bought some boneless turkey breast at the store, and since I didn’t have a plan for it, I just threw some things together. And you know what? It was delicious. I made it a few more times to get the recipe down pat, and it is so easy. This will definitely be a family favorite. That is, until your 3-year-old is inhaling her dinner and then bites into a piece of fat and declares her dinner is “disgusting” and refuses to eat anymore. The next day, she inhaled the leftovers and kept begging for more turkey… well, she thought it was chicken. It’s hard to believe that almost a year ago, my mom made some turkey breasts for our small little family Thanksgiving. She was in town helping us when baby Ari was born (you can check out his really fun birth story here), so our Thanksgiving included my mom, husband, August, and Ari. Take me back to last year when he wasn’t mobile and trying to throw every thing in sight! 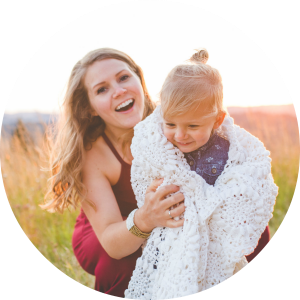 Clearly, I’ve been having a lot of feels regarding Ari turning one. Anyway, we made all the Thanksgiving goodies, just on a smaller scale. And it was our first time making roasted turkey breast, but it was definitely not our last. It’s so much easier than doing a whole turkey. Your family doesn’t like dark meat. Why make the whole bird when your family only likes white meat? Just cook turkey breasts. Your Thanksgiving is going to be small and you only need to make enough turkey for a few people. Save yourself the hassle and make this easy boneless turkey recipe. Cooking a whole turkey is hard work and takes a long time. This baked roast turkey breast takes a fraction of the time to cook and even less time to carve. You are having a really big Thanksgiving and need extra meat without having to make a whole extra turkey. The first time I made this, it was a whole turkey sheet pan dinner. Really. 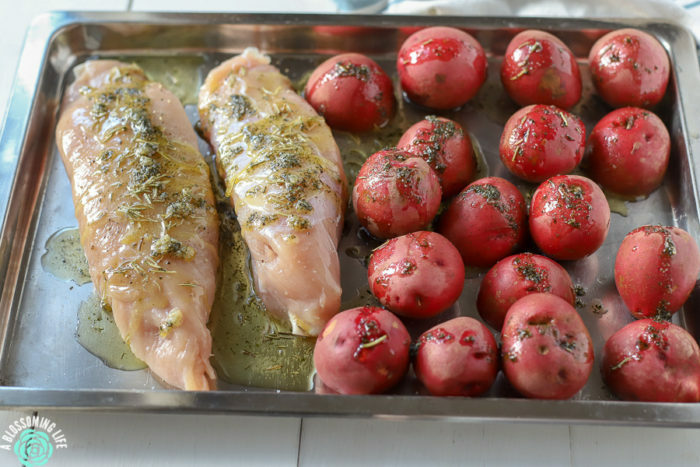 I baked the whole meal together on one sheet pan. Easy clean up with only two dishes, and it was seriously tasty: the best kind of meal. Carrots or parsnips with green beans. Add fresh green beans when there is about 30 minutes left in the cooking time. Sweet potatoes and asparagus. Bake sweet potatoes, then add fresh asparagus with 30 minutes left in baking time. Make it for Thanksgiving (may take two sheet pans) with potatoes, sweet potatoes, green beans (added with 30 minutes left in baking time), and make some Stove Top stuffing. Yum. Preheat oven to 375. 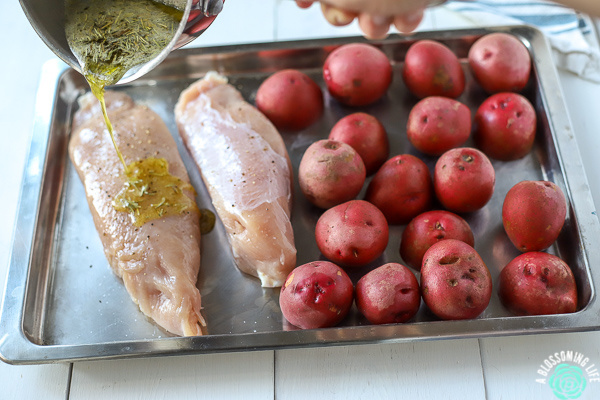 Cover a baking sheet with parchment paper (my preferred) or aluminum foil (I try to avoid aluminum). I didn’t for pictures, but usually I do cover it I promise. In a small saucepan, add a few tbs of butter, 1 tsp parsley, and 1/2 tbs dried rosemary, salt and pepper. Melt butter and bring to a simmer. 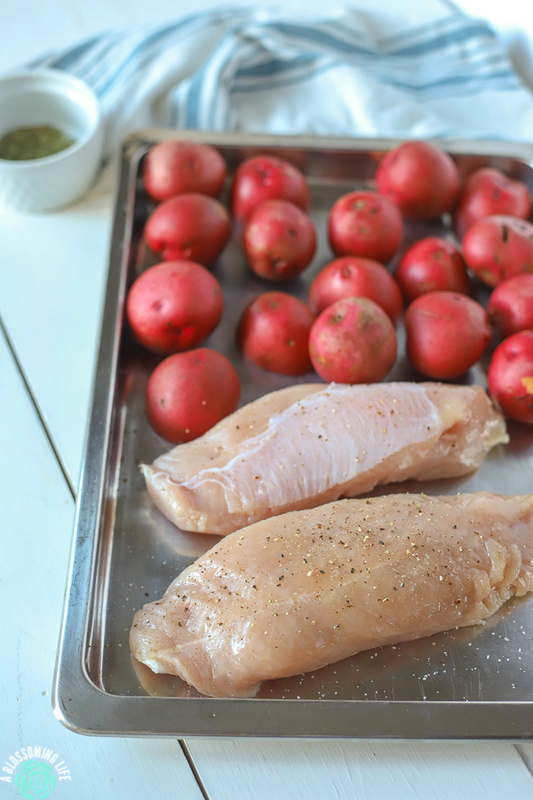 Place boneless turkey breasts and any vegetables desired on baking sheet. Pour herb-infused butter over top. Add more salt and pepper as desired. Bake for 45 minutes to an hour and a half, until the internal temperature reaches 165 and juices run clear. Let rest for 10-15 minutes so the juices stay in the meat. This simple recipe for Roasted Turkey Breast is bursting with flavor from herb-infused butter and is cooked to perfection, creating a juicy and tender turkey breast. This easy turkey dinner recipe can be made any night of the week or for a small Thanksgiving get-together. Preheat oven to 375. Cover baking sheet with parchment paper (my preferred) or aluminum foil (I try to avoid aluminum). Place boneless turkey breasts and any vegetables desired on baking sheet and pour herb infused butter over top. Salt and pepper as desired. How long does it take to cook a turkey breast? It does depend on the size, but a turkey breast usually takes about 20 minutes per pound. So if you have a two-pound breast, it will be about 40-ish minutes. How do you know your turkey breast is done? The best way to know it is done is by the internal temperature reaching 165 degrees. When you slice it, there should be no pink, and the juices should run clear. Why do you let the turkey rest before slicing and eating? By letting it rest, you are letting the juices go back into the meat. If you cut it too soon, the juices will just run out and the meat may end up being dry. 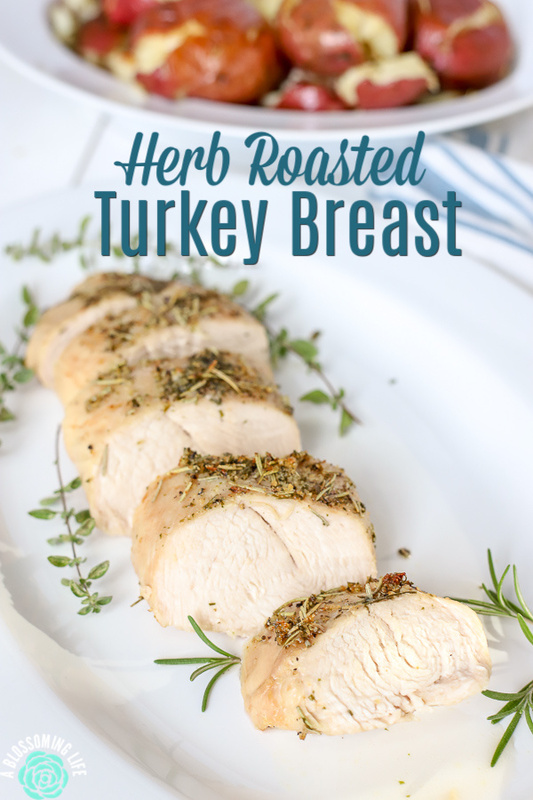 Absolutely love cooking turkey breast and this herb-infused butter is right up my alley. Will make this as soon as I can purchase the turkey– Looks SO good!! You had me at butter! This turkey looks so tender and delicious. So perfectly cooked!